I’m always more critical of Latin American restaurants than any other type of cuisine. It’s not because I grew up in a family where food was celebrated and the standards were always exceptionally high; it’s not because one of my uncles is a respected red-seal executive chef; it’s not because my mother is a revered chef who’s earned many awards for her Latin American cuisine and I grew up eating that food every day; no, it’s not for any of those reasons. It’s only because I want to see them succeed. I feel a personal connection with “my people” and I have a sincere desire to help them improve. Sure, growing up around so much incredible food has heightened my awareness, refined my palate and unavoidably elevated my standards. But I’m also well aware that imposing those lofty standards on anyone else would be setting my expectations way too high. That said, while I do relax my standards and set out to not be hypercritical, it’s still nevertheless very difficult to accept less than perfection when you’re so passionate about something. I can’t remember how, or exactly when I was first introduced to Mi Pueblo, but I remember it was more than eleven years ago (back in 1998 or 1999). 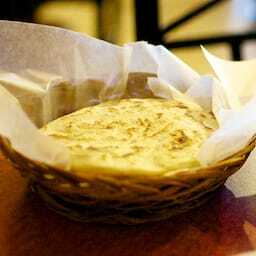 Yes, they’ve been around for quite a while, but when you taste their pupusas, it’s easy to understand why. I recently went back to Mi Pueblo after more than six years and I was very happy to see that over the years, rather than getting too comfortable and settling for mediocrity like I see so many places do, they’ve actually made numerous improvements and continue to move forward! This is the kind of place I could take my non-hispanic friends to – a great place to introduce them to Latin American cuisine and feel proud about it instead of feeling the need to make excuses… Atypical of Latin American Restaurants, Mi Pueblo actually seems to have a consistent theme with their decor – the tables all match, the chairs all match, the walls are painted a nice shade of brown, the china and cutlery all match – everything works well together and compliments the beautiful laid-back atmosphere. Nicely done! Enough about the decor though, the food is the real reason I went, and that didn’t let me down at all either. Every country in Latin America has their own version of tamales, and every province, city and town has their own way of making them too. Maybe even every family. They vary quite a bit. The chicken tamales at Mi Pueblo were typical of tamales from El Salvador, but it was also the first time I’ve had these kind of tamales with cilantro in them. I could also taste a stronger than normal presence of green pepper (as if they were fire roasted and then blended into the corn flour) but both were very welcome additions. In fact, Michelle and I have thought about incorporating these ideas into our own tamales when we actually get around to making them. Being the glutton that I am, I also ordered a Sopa de Res (beef soup) to preface the pupusas – it was prepared very traditionally and was exceptionally delicious. It was a very large portion of soup (typical) and they were surprisingly very generous with the meat and vegetable ingredients too. Of course, you can’t go to Mi Pueblo without ordering some Pupusas – or at least, that’s always been my main attraction to the place. Apparently I’ve gotten used to the tiny pupusas you find in Calgary, (under the excuse that smaller pupusas are the only way you can keep them profitable) because I found the pupusas at Mi Pueblo to be quite large for the $2.50 price. They’re also super generous with the fillings (cheese with loroco, chicharrón, squash, beans, or revueltas/mixed). Overall, I was very impressed with not only the portion size, but also the quality of the ingredients and their preparation. Very well done. In terms of the curtido and tomato sauce, they were nothing spectacular but it’s worth mentioning that the portion we were served (extra charge if you want more) was much more than enough for the pupusas we ordered. In El Salvador when you go to a Pupuseria, the curtido and tomato sauce are already on the table and are unlimited, but the concept of portioning them and charging extra for more is very common in USA and Canada. They’re just condiments, so to me it’s like charging extra if you want more ketchup, but I understand that a lot of people abuse this to the point that it makes it hard for restaurants to remain profitable. Like I mentioned, there’s so much they’re doing right at Mi Pueblo that it’s hard to find anything negative to say. Being very picky though, there are a couple things I can mention… The bathrooms are in need of a reno, my horchata was a little too sweet, and I personally don’t like getting curtido or tomato sauce in styrofoam containers – having some kind of stone or ceramic containers for these would be much better. But again, I’m being super picky here. Mi Pueblo Restaurante was published on Wednesday, March 2, 2011 at 3:11pm EST by Daniel Menjívar and last updated on April 11, 2018 at 9:30pm UTC .